With our 30 foot yellow trailer, we can be found at many locations throughout Northwest Arkansas. We are at the Parson’s Arena events including Monster Truck, Demolition Derby, Rodeo of the Ozarks and PBR. During the spring and fall NWA craft fairs, we are at the Frisco Mall in Rogers and on Saturday mornings, we are at the Downtown Rogers Farmers Market. The Junk Ranch in Prairie Grove has fun events twice a year and a similar event is The Chicken Ranch Vintage Market in Jones, Oklahoma. In the fall, we are at McGarrah Pumpkin Patch in Pea Ridge followed by The Stewart Family Christmas Lighting Display in Fayetteville. Check out our calendar to see where we'll be next! 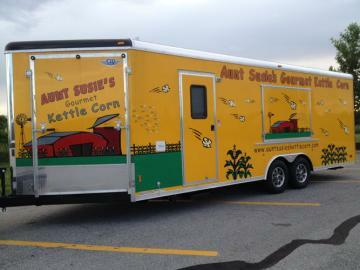 At Aunt Susie’s Gourmet Kettle Corn, we'd be happy to partner with you and your organization or non-profit. In the past, we have partnered with charitable organizations, schools, and many other good causes. We are proud to give back to all of those who give so much to us. Contact us today about your fundraising event!